Clidemia hirta var. elegans (Aubl.) Griseb. Shrub up to 3 m tall and 2 cm dbh. Stipules absent. Leaves opposite, simple, tripli-veined, hairy, margin toothed. Flowers ca. 12 mm diameter, white, placed in panicles. Fruits ca. 5 mm diameter, blue-purple, fleshy berry. In disturbed habitats, including keranga, mixed dipterocarp and peat-swamp forests up to 300 m altitude. Often found along roads and rivers and alluvial sites, but also on hillsides and ridges. On sandy soils, but also on limestone. Pan-tropical, but originally from Neotropics and southern United States. 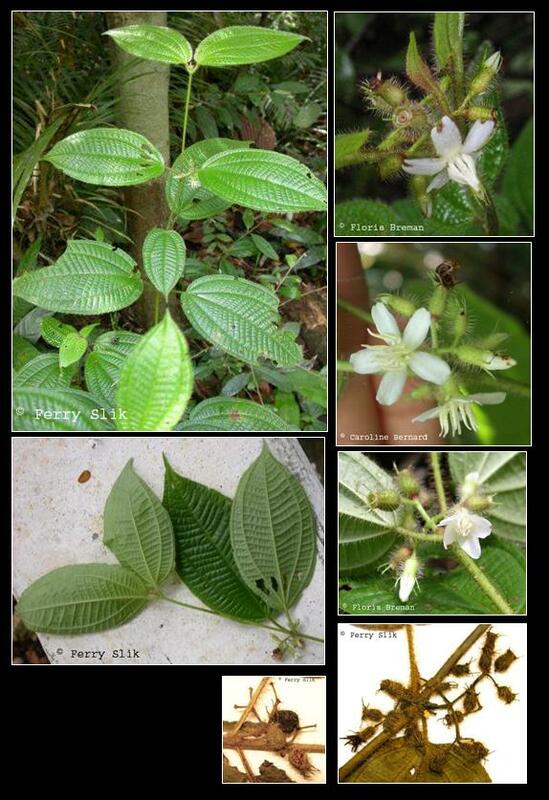 In Borneo collected in Sarawak, Brunei, Sabah and East-Kalimantan, but probably occurring throughout the island. This species is a notorious pest around the tropics. Borneo: Bahang, Kunceng batu, Oduk-oduk batu.